The meeting tomorrow will allow agency officials to provide updates about what they’ve learned so far, and will give energy experts and other interested stakeholders the opportunity to weigh in with additional intel and perspectives. Here are three things to keep in mind ahead of tomorrow’s hearing. We must continue to advance the science behind oil and gas wastewater. Traditionally, this wastewater, or “produced water,” has been disposed of through underground injection – a practice that limits exposure potential. It is extremely salty, and can contain any combination of over 2,000 different chemicals. 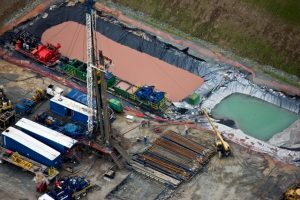 In addition to reduced exposure risk, reinjecting produced water underground has long been viewed as one of the most economical disposal options, and most logic dictates that utilizing disposal wells will remain a key management strategy into the future. However, in some areas this practice has led to earthquakes. In other areas, the opportunities to inject produced water into disposal wells is shrinking and costs are growing. Many operators are looking at opportunities to recycle this wastewater to replace their fresh water use in the oilfield – a good practice that should be implemented to the greatest extent practicable. For numerous reasons, however, even recycling for oil and gas operational use will have its limits. All of these factors are reasons why EPA is looking into alternative disposal options for produced water. In this study, the agency is primarily investigating the need and interest in expanding opportunities to treat and discharge produced water into rivers, streams, or other water bodies under the National Pollutant Discharge Elimination System (NPDES) program. Unfortunately, the limits of what we currently do and don’t know about the chemicals and toxicity of produced water are significant. Uncertainties and limitations in our ability to identify the constituents of concern in produced water and understand health and other toxicological risks from their release at varying levels make it difficult to establish appropriate goals for treatment systems and define protective limits and that will guide permit writing. The fact that EPA appears to be moving cautiously down this path with a fact-finding effort on the current state of play is positive, but this first effort should be viewed as one of many steps that need to happen to protect our natural resources from exposure to harmful chemicals if and when produced water discharge practices change in the future. If EPA decides to take on a modification of the current guidelines surrounding oil and gas wastewater discharges, their effort will have to comprehensively tackle the challenges on analysis and treatment that have been identified by stakeholders like EDF, and EPA itself. Whatever whitepaper the agency produces at the end of this process should provide not only a summary of stakeholder positions on the best path forward, but also clear guidance on the research needed to better understand the risks of exposure to this waste stream and inform any future decision making on discharge regulations. Until science improves, wastewater discharge should be limited. EDF has worked with over a dozen research institutions and academic partners to help advance what we know about produced water. As a result of this research, we’ve learned a lot about produced water character and toxicity – much of which will be published in the coming year in peer-reviewed literature. For now, there are a few relevant and practical learnings EPA should consider in this initial consideration of expanded discharge options. First, because produced water is often so salty it can be very difficult to detect and costly to remove concerning chemicals. EPA approved analytical methods exist for less than 25 percent of chemicals we know may be present. Developing accurate detection and quantification methods for an expanded set of constituents of concern will take considerable time, but will be vital to support development of a reliable and protective effluent guideline program. EPA cannot establish guidelines and permit writers cannot limit constituents that are not detectable and quantifiable via approved methods. Second, current scientific literature on produced water characterization is for the most part limited to two geographic regions: the Appalachian and the Denver-Julesburg (DJ) basins, meaning that most existing peer-reviewed literature available to EPA to inform any potential rulemaking to establish new guidelines for discharged is significantly skewed. This is a particularly important challenge if one considers that the regions most interested in expanding discharge options are not in Appalachia or the DJ, but rather in states like New Mexico, Oklahoma, and Texas where data is more limited. In establishing effluent guidelines, EPA will be charged with defining the best available technologies and associated treatment objectives to remove constituents of concern and prevent discharge of any toxics in toxic amounts – that means EPA will need to understand treatment influent (produced water pre-treatment) in order to analyze removal success in treatment effluents. If existing data is not adequate to paint a national picture of produced water quality and the analytical tools necessary to better build out that picture are lacking, that spells trouble for the agency, the industry, and the communities or ecosystems that may be at risk if discharge programs proceed without real scientific advancements. Moving forward with more expansive discharge opportunities without advancing the science could effectually create more problems than it solves. We need to strengthen our current standards for wastewater discharge. While it’s clear that significant challenges exist, that doesn’t necessarily mean that the evaluation of current regulations is inappropriate. In fact, EPA itself has recently acknowledged a number of shortfalls in the effluent guidelines on the books today for produced water discharges from larger, centralized treatment facilities – including the very basic limitation that the current standards weren’t originally written for constituents present in produced waters. Outside of these industrial facilities, onsite discharges from oil and gas operations are currently banned. However, companies in the Western part of the United States can obtain discharge permits under an existing exception to that rule, if the discharge is considered “good enough quality” for agricultural or wildlife use. This “good enough” guideline is not defined, and that lack of clarity can pose a problem. It can be very difficult for researchers, regulators, or companies to know with certainty what it actually means to achieve that quality standard, and equally challenging for eventual end users to be confident that pollutants of concern aren’t present in dangerous amounts. As EPA investigates the potential to expand these options for produced water discharges in the future, the agency will have to grapple with the shortcomings of the current guidelines alongside very significant data and analysis limitations. If this is to be done right, it will take time. So, while EDF supports the EPA’s effort to learn more about these issues it must be emphasized beyond anything else that we have to proceed with caution. Access to clean, fresh water is a non-negotiable.